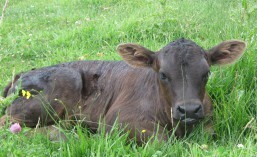 The deer is still in the field with the cows and then explores the rest of the farm once we have gone inside. Last night Bambi was wandering right outside our bedroom window. Three nights ago a flock of Sandhill cranes flew over the fields, taking a test flight for their impending migration. Canada geese are flocking, as are the abundant sparrows and resident California quail. The corn stalks are papery and brown and elicit saliva from our cows. Every autumn they get to clear the corn field, munching until the stalks are little stobs in the ground. All of these transitions of the season! Alas this is the final week of veggie feast. 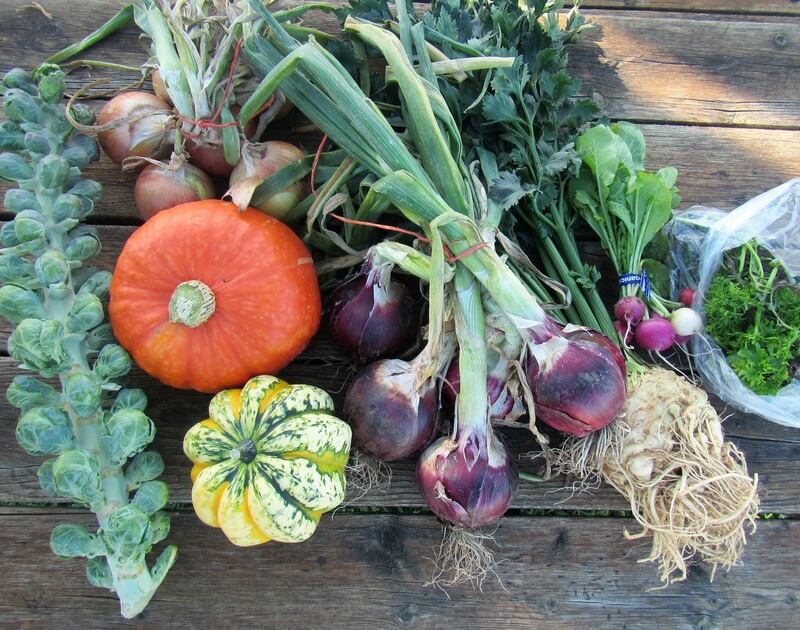 We have had an abundant and successful season and we hope you have enjoyed the bounty. Thank you for supporting us and supporting local. Last week of Veggie Feast!! Radishes, sunshine winter squash, spicy mustard greens plus lots of new varieties! 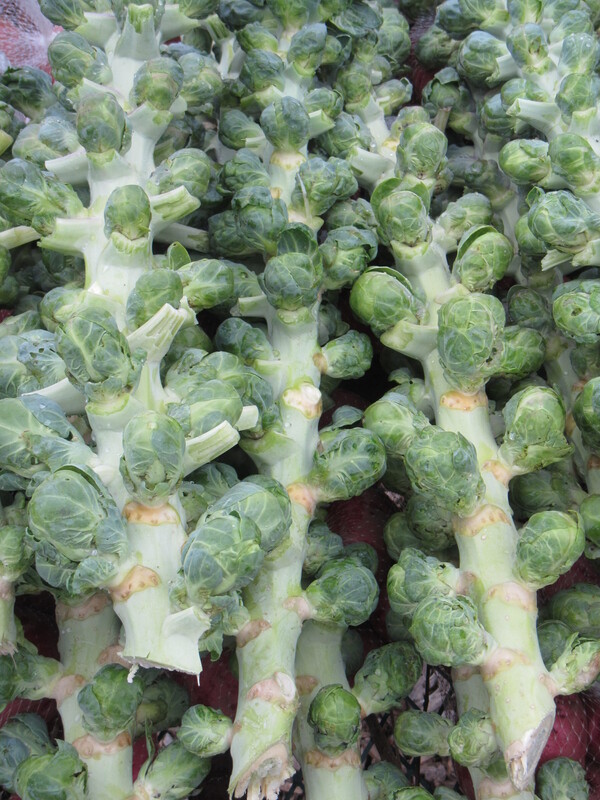 Brussels sprouts are a member of the brassica family along with cabbage, broccoli, and cauliflower. They grow on a long, thick stalk, the little cabbage-like buds attaching right above each leaf node. Pop off the sprouts and store in a container/bag in the fridge. Brussels can store for weeks, but eventually the outer leaves turn yellow. It’s a pain to pick the yellow bits off (but can be done!) so try to use them while they are still fresh. Great steamed or roasted. Celery Root is just what it sounds like, the root of a celery plant. 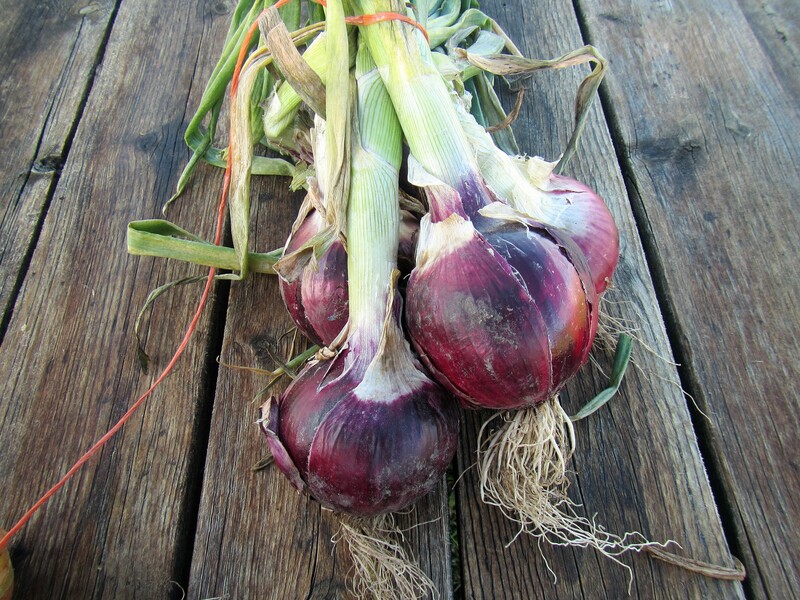 This variety is grown for its root, and unlike celery you buy in the grocery store it doesn’t taste like water. In fact it has quite a distinct, strong flavor. The stalk and leaves can be used to flavor soups and casseroles. The stalk is quite stringy, so use it as a flavoring agent, not as a tender morsel. The leaves dry nicely for future usage. Here are some note on using the stalk from our website. 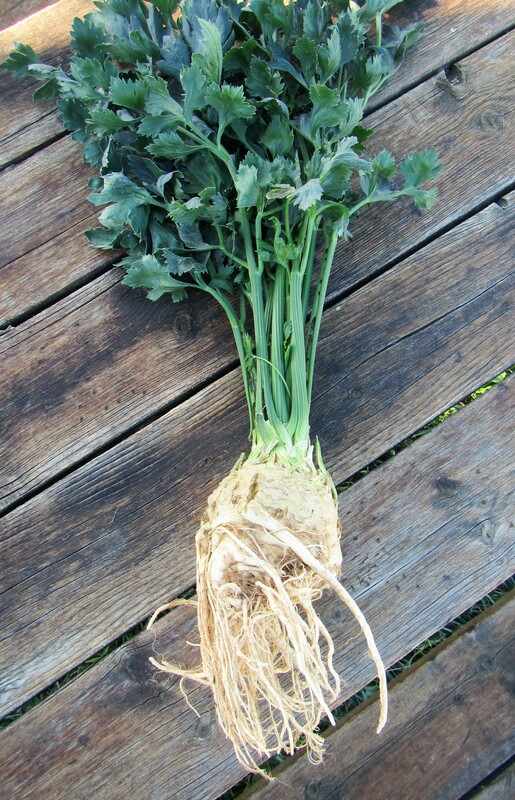 Celeriac can be eaten both cooked and grated raw for salads. For cooking purposes, this root vegetable takes well to soups, purees, and gratins. The root needs to be scrubbed well and peeled. To peel the root, cut the top and bottom ends off to create a stable surface and then using your knife, cut away the peel in a downward motion. If you have a heavy-duty peeler, you can try using that if the root is not to knobby. Cut pieces turn brown quickly, so place cut pieces in a bowl of water acidulated with lemon juice or vinegar. If you prefer to use the entire vegetable, any pairings from peeling can be put in a vegetable stock. Take time to remove and save the green ribs before storing, which can be added to stocks or soups. The root will store for several weeks in a plastic bag in your refrigerator. Celeriac goes well with butter, cream, walnuts, hazelnuts, Gruyère cheese, parsley, mustard, potatoes, apples, mushrooms, and wild rice. These red and yellow onions are not quite cured for storage. They need to dry out a bit longer. 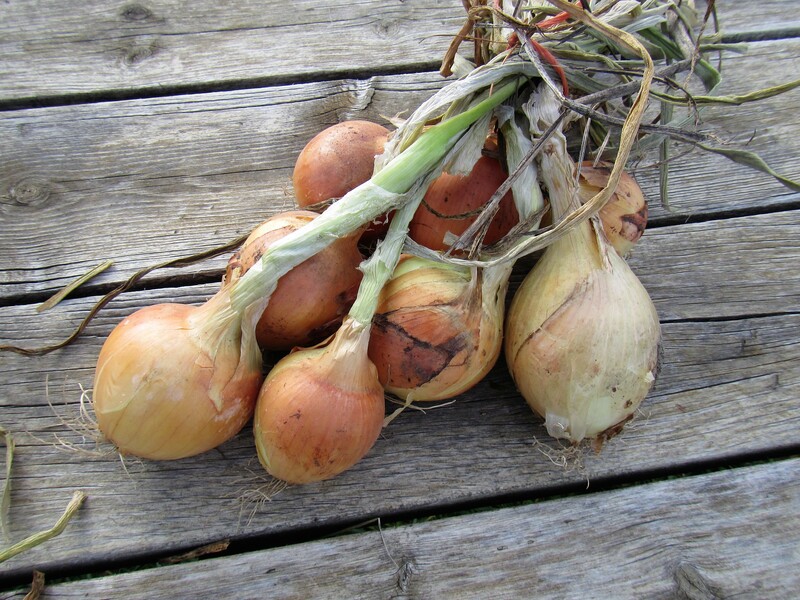 Simply place them in a cupboard or pantry for 2-3 weeks until the tops are completely dry, clip the tops and voila, you have storage onions. Of course you can also use them up right away if you an onion lover like we are. 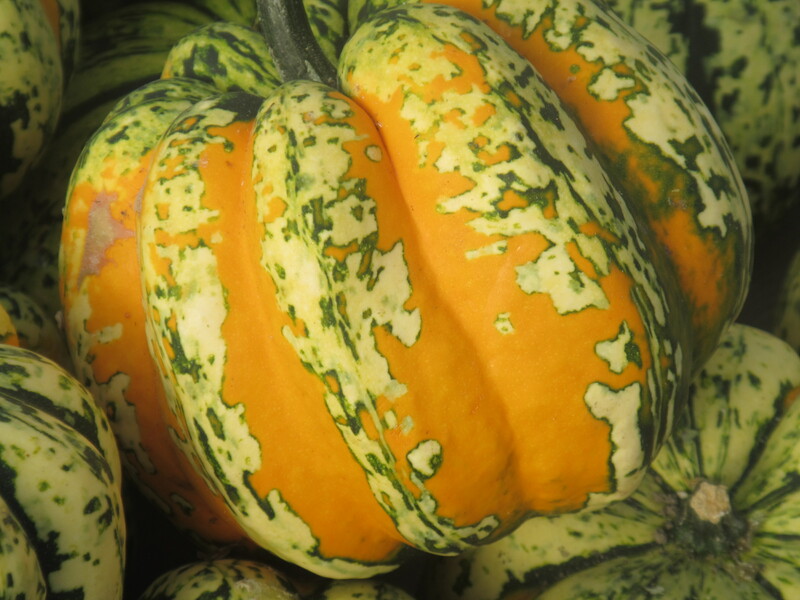 Carnival Squash is a type of delicata winter squash. The flesh is a light yellow and has a delicate flavor. The outside, as you can see is a festivity in and of itself, hence the name. Carnivals will store well thru Thanksgiving and possibly into the New Year. Saute the onions or leeks in a large soup pot with some olive oil. Add the carnival squash, celery root, carrots, apples and veggie stock to the pot. Add enough water to cover the veggies by an inch. Boil this mixture until all the veggies are very, very soft. 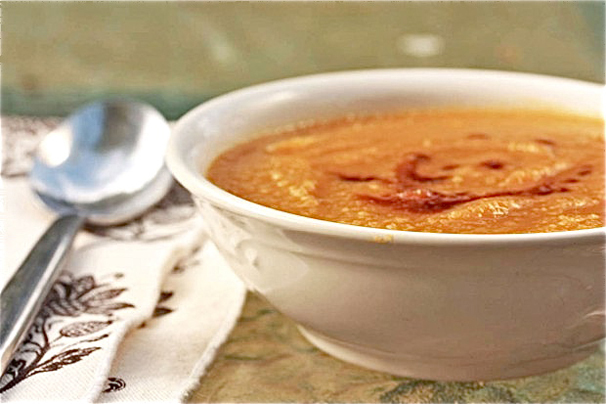 Blend all of it with an immersion blender or in a regular blender in batches until super smooth. Add the cream and stir to combine, if using. Season with salt and pepper. After the soup is served in the bowls, top with a few homemade croutons and some bright herbs, such as dill or chives.